Do a survey in your congregation. Ask them to name five things that they currently struggle with and I am sure that one of them is financial strife. Credit card debt. Student loans. Mortgages. Utility bills. Different names—the same problem. Lack of money. As a pastor, you have a fantastic opportunity to help your congregation win financially and overcome lack through Biblical and practical teaching. You have a captured audience that is hungry for help. God does care about our finances. He has placed Biblical principles in His Word, the Bible, and we are to teach these in the pulpit. Concepts such as tithing, sowing and reaping, generosity, and investing in the Kingdom of God are topics that your congregation need to hear if they want to overcome financial difficulties. Unfortunately, most pastors are afraid to preach these for different reasons. You must find the conviction to talk about these in the pulpit if you want to help your congregation with their money issues. Jesus spoke many times about finances when He was on earth, why not you? You know as well as I do that we cannot teach everything about financial stewardship in the pulpit. There are intricate details that can fly over one’s head especially when numbers and computations come into play. That is why I suggest that you start a Biblical Stewardship Class, which will run on a particular time frame (say eight weeks). In this class, you can teach both the Biblical significance of stewardship and the practical means of getting out of debt. Considering that you may not be that equipped with the practical side of finances, why not partner with a ministry that conducts training on financial freedom in a Christian perspective (e.g. www.wealthwithpurpose.com). They already have modules and lessons which are taught by their experts. 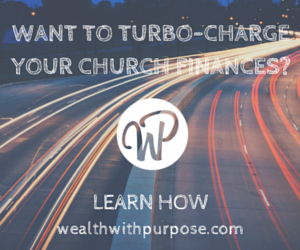 Setting up these classes enables your churchgoers to take that determined step in fixing their money problems. Ask other pastors or google for ministries that can help your church with financial stewardship classes. Sometimes, it is not a lack of money but an excess in lifestyle. A second car. A second home. Four credit cards. Lavish spending on vacations and jewelry. Don’t get me wrong. We are not saying that our should people live like rats and not enjoy the fruits of their labor. What we are saying is that our congregation should live within their means. So much money is coming in our household, but so much money is also going out due to unnecessary expenses. Challenge your church to make lifestyle changes. Some may need to do this immediately. Warn your church: This will be tough. We can be clingy when it comes to our toys, trips, and trinkets. But one must come to terms with the concept that our wrong spending choices brought us to a difficult situation, and it is the right decision that will bring us out of it. They may need to let go of certain things like that second house or car. Maybe cut that cable subscription that they do not watch at all. Or how about letting go of that new phone upgrade since their current phone still works well. Stop spending money that you do not have with things that you do not need to impress people you do not like. It is time for a drastic change if you want your finances to improve. Encourage your congregation to make drastic lifestyle changes. If they want to be set free financially, they must choose to let go of things they perceive as vital but, in reality, are not. Pray and ask the Holy Spirit for guidance and that He will give them the strength to do what is right. Those who undergo a financial crunch are often stingy. Your church should go against the flow. Encourage them to be generous. Generosity is a power practice of true financial freedom. Most people think that they will start giving when they have more money in their account. But one’s capacity to give is not based on their wallets but on their the heart. Remind your church about the boy who gave Jesus the five loaves of bread and two fish. That was all he had. Yet, he was instrumental in feeding more than 5,000 people. He was a blessing to others, and he was blessed in return. 1 Timothy 6:18 (NIV) says, “Command them to do good, to be rich in good deeds, and to be generous and willing to share.” Being generous lets us exercise our will and our spirit in doing what is good. Being generous enables us to help those who are also in need as we become a blessing to others. Winning against the grip of financial strife is not just paying bills or settling debts. It is having a lifestyle of generosity through monetary giving. When your church members give, it is also saying that money does not control us, that we are just stewards of God’s blessings, and that we can let it go towards those who need it more. Helping the congregation win financially must be the goal of every pastor for their church. As your people experience financial freedom, practice genuine generosity, and live a modest lifestyle, they become a true testament to a blessed life. And when you have a generous congregation, your church will be able to do more for the glory of God.